It is the standard model in the Indian lineup with retro-classic appeal carried forwarded straight from the 70’s. For this modern-classics, the company asks for INR 1.64 lakhs (ex-showroom, India). 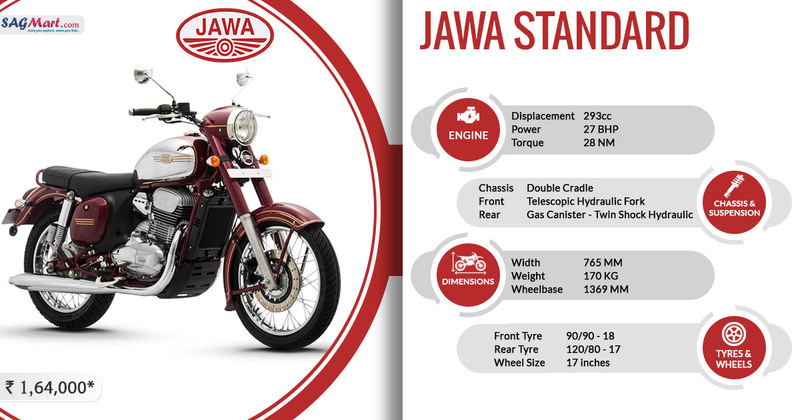 In terms of styling, the motorcycle gets the components like the large fenders, dual tone-fuel tank with chrome accents and an airbox unit as similar to the original Jawa 300. Other than this, the retro-themed classic uses upfront forks shrouds that goes to the instrument console. In the segment, it will see competition with the likes of Royal Enfield 350 bikes.